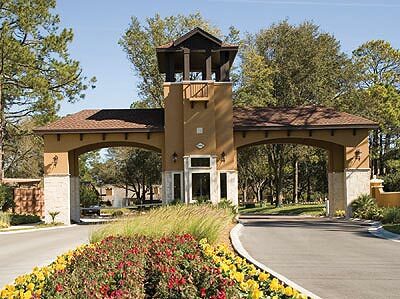 Summer House condominium community in Ponte Vedra Beach, Florida. Summer House is a 400+ unit condo conversion project by Julian LeCraw encompassing two sections on the west side of A1A and the east side of A1A. Located in prestigious Ponte Vedra Beach, this gated residential community offers five star amenities including 24-hour gate attendent with controlled access, a new clubhouse with theatre, Resident's Lounge, business center, tanning and spa room, pub with billiards and darts, fitness center with full-time Resident Services Director and on-site fitness instructor, two resort-style pools, seasonal pool attendant, poolside bar, chilled towel service, water aerobics, three tennis courts, community porter, concierge service, spa services, on-site car wash, shuttle service to the beach with chair and umbrella service, poolside towel and beverage service and discounted golf memberships with tee time shuttle service to Oakbridge at Sawgrass Country Club. Summer House offers a variety of stylish floor plans ranging from one bedroom to three bedroom, all of which are surrounded by mature, native landscaping. Choose from the Villa, Bungalow or Cottage. Each home features stainless steel GE appliances, granite countertops, ceramic tile flooring, wood cabinets with brush chrome hardware and fixtures, decorator lighting package and screened lanai. Some select homes offer private couryard and wood-burning fireplace. Unlike the typical sleepy coastal towns that dot much of Florida, Ponte Vedra is a vibrant community running along nearly 15 miles of pristine Atlantic Ocean beachfront. Here you'll find the finest of everything. For shopping excursions you can visit the Shoppes of Ponte Vedra and Sawgreass Village Shopping Center. As for fine dining, choose from a variety of restaurants like Medure, Ruth's Chris Steakhouse, or Sobu. For golf enthusiasts, the area offers some of the most scenic and prestigious golf in the nation and the Association of Tennis Professionals calls Ponte Vedra home bringing even more attention to the area as a recreational paradise. Ponte Vedra was recently voted as one of the best places to live in 2005 by Money Magazine, using criteria such as education, environment, housing affordability, taxes, commute times and job market. According to Money Magazine, Ponte Vedra Beach is ranked the top city to live in Florida. Enjoy the Beach lifestyle of fun, sun, ocean breezes, and the sound of crashing waves. Close to all that the Ponte Vedra Beach have to offer, you'll never want to live anywhere else.